New Horizons Stamp Drive Completes a 10K – and Keeps Going! As fast as NASA’s New Horizons spacecraft is heading toward Pluto, the drive to honor this historic exploration of the ninth planet is speeding toward its finish. Less than a week remains to put your name on the petition supporting an effort for the U.S. Postal Service to commemorate Pluto and New Horizons on a postage stamp. In just over a month since the drive was announced, more than 10,000 people have signed the online petition. But mission leads would like to have many more signatures before they close out the list on March 13 – the 82nd anniversary of the announcement of Pluto’s discovery by American astronomer Clyde Tombaugh. 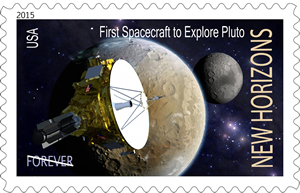 Articles and support for the stamp drive have come from Astronomy, Space.com, Discover’s “Bad Astronomy” blog, The Planetary Society, the National Space Society, MSNBC’s Cosmic Log and many others. With these highly appreciated endorsements spreading the word across the space science universe, signatures have come in from across the U.S. as well as the United Kingdom, France, Germany, Poland and other nations. Launched in January 2006, New Horizons is currently 2.1 billion miles from home, flying some 34,000 miles per hour toward a July 2015 encounter with Pluto and its moons, which are just over 3 billion miles from Earth. The mission team started the formal stamp proposal last month, knowing the USPS requires proposals three years or longer before an actual stamp can result.